Cleaning your roof does more than just keep your house looking good. It also removes mildew, moss, leaves, grit, and other debris that could damage your roofing and eventually cause leaks. With the right equipment and cleaning products, you can get your grimy, mildewy roof looking like new again. Before you start, find someone who can help you with things like moving the ladder and cleaning equipment or bringing things to you. Having a helper reduces the risk of accidents. Have all your equipment and cleaning products ready before you start work. To prevent falls, wear sturdy, non-slip shoes and, when possible, use a safety harness and rope tied to a tree or other sturdy object. Wear safety goggles to keep spray out of your eyes. A pressure washer is often the best choice of equipment for cleaning an entire roof, but using one takes some preparation. Take note of anything near the house that could be damaged by wet spray and cleaning products from the roof. Close your windows and doors tightly. Move or cover garden furniture, decor, and vehicles. Turn off the electrical mains to your outdoor lighting. Soak plants around the house to dilute cleaning products that fall on them, then cover large shrubs and other plants with drop cloths. Trim back any branches hanging near the roof and remove objects such as Christmas lights and stray toys. While a power washer is your most efficient option for cleaning your asphalt or wood shingles, each type of shingle requires a slightly different approach. Before you start cleaning, check for damaged shingles and note their location so you can avoid spraying them, which could further damage them. Trisodium phosphate (TSP), a heavy-duty degreaser available at home improvement stores, works well on asphalt shingles. Check the product packaging for directions for use. If no directions are available, start by diluting 1/2 cup of trisodium phosphate in 2 cups of water. Then fill a bucket with 1 1/2 gallons of water and 1/2 gallon of bleach. Mix the diluted trisodium phosphate into the bleach water and pour the mixture into your power washer. Choose a pressure of around 1200 to 1400 psi. Hold the sprayer 3 or 4 feet from the roof surface and aim it at the highest point on the roof. Start spraying downward in even motions toward the gutters. Spray over the whole roof and let the solution soak in until the grime starts to fade. Finish up by rinsing the roof with a garden hose and attached sprayer head or with plain water from your pressure washer. Wood shingles are relatively delicate, so they should be pressure washed on low pressure (1000 psi or less) using a mild cleaner based on sodium percarbonate or with oxygen or chlorine bleach. If you opt for bleach, make a solution of one part bleach and five parts water. On the power washer, use a fan spray nozzle that distributes water over a broad area, rather than producing a concentrated jet. Spray from the top of the roof downward, holding the nozzle at a downward angle to avoid forcing water up under the shingles. 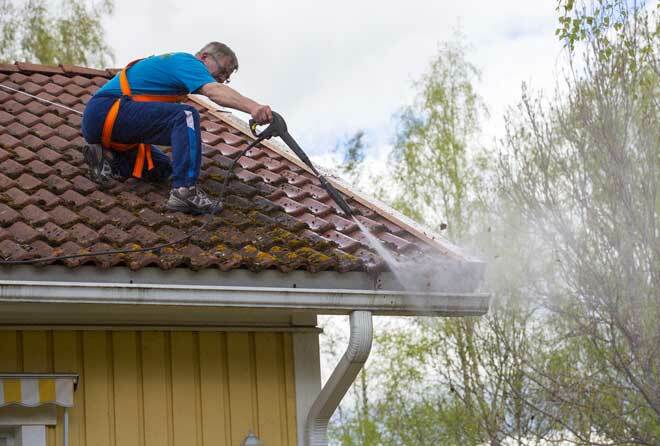 Wait until the roof is dry, then check for any dirty shingles that need to be cleaned by hand with a soft scrub brush. Cleaning these tiles requires a tile roof cleaner specially formulated for clay or concrete. These cleaners soak into the pores of the roofing material to break down grime and mildew. Before you use this cleaner, power wash the roof with plain water. Use a low to medium pressure of around 1,200 psi and spray in even motions to avoid cracking the tile. 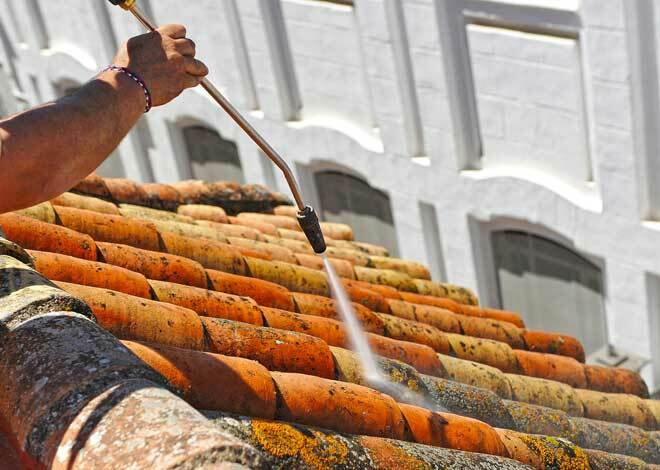 Once the roof is dry, clean it again with the tile roof cleaner. Follow the product directions or mix 3/4 cup of tile roof cleaner in 1 gallon of water. Add this to your pressure washer, and spray down your roof using the same process you used for the first cleaning. When you’re finished, spray the roof again with water to rinse off the cleaner and the grime. Cleaning a metal roof is a straightforward job. Before you start, remove any peeling paint or corrosion to avoid worsening the damage during cleaning. With a wire brush, gently scrub the peeling or rusted area until it’s smooth. To clean the roof, mix 1/2 cup of trisodium phosphate in 1 gallon of water. Add this to a pressure washer and wash the roof starting from the highest point and working downward. After the roof is dry, prime and repaint the spots where you scrubbed off paint and rust. Slate is a highly durable, yet delicate roofing material. Incorrect cleaning can cause slate to delaminate so that the tiles begin to chip and deteriorate. 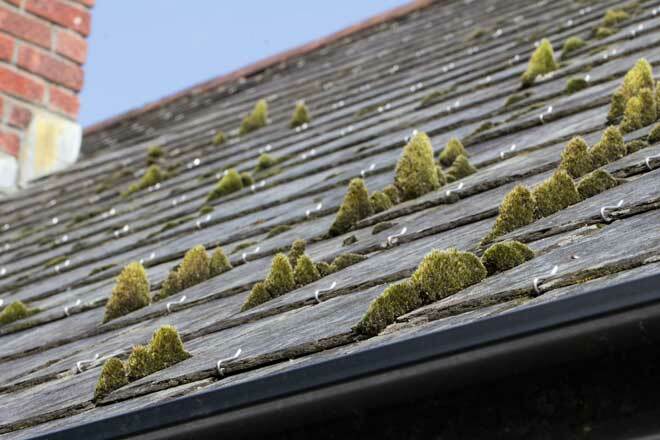 If your roof is covered with moss, the safest approach is to manually scrape the moss off using a rubber rake or scraper. Then apply a fungicide to kill remaining moss spores. This is often enough to clean the roof without the need for power washing. Work from a ladder and avoid walking on the roof, which could damage the tiles. If you’re not able to do this, consider hiring a professional. Regularly cleaning your roof helps prevent moisture and rot problems by getting rid of the moss, mold, and dead leaves that hold in moisture. It also washes off abrasive dirt, grit, and twigs that can cause damage. This not only prolongs the life of your roofing, but also keeps your home looking inviting and well maintained.